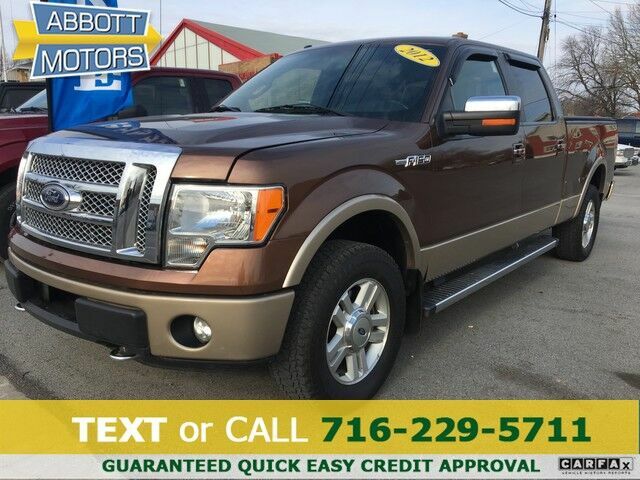 ABBOTT MOTORS, An exceptional car buying Experience, is offering this exceptional Two-tone 2012 Ford F-150 Lariat SuperCrew 4WD w/Heated Leather for sale. Comes fully serviced and safety inspected with Warranty. ABBOTT MOTORS has over 50 years of automotive experience! We are also a CARFAX Advantage Dealer. We offer great deals and specialize in FINANCING FOR EVERYONE-ALL CREDIT APPS ACCEPTED! We look forward to helping you purchase your next vehicle. CALL or TEXT (716) 229-5711 for quick answers to your questions about this vehicle. Your message will be answered by a real human never an automated system Drive home in your new pre-owned vehicle with the knowledge you're fully backed by the CARFAX Buyback Guarantee. You deserve a vehicle designed for higher expectations. This Ford F-150 delivers with a luxurious, well-appointed leather interior and world-class engineering. Take home this Ford F-150 Lariat SuperCrew , and you will have the power of 4WD. It's a great feature when you need to drive over tricky terrain or through inclement weather. Intricately stitched leather and ergonomic design seats are among the details in which test drivers say that Ford F-150 is in a league of its own The interior of this Ford F-150 Lariat SuperCrew 4WD w/Heated Leather has been through meticulous inspection and could almost pass for a brand new vehicle. Some vehicles are more of a need-to-have. This one is a absolutely-must-have. If it's looks aren't enough to persuade you, the feel of the powerhouse under the hood most definitely will. When this vehicle was shipped from the factory, Ford decided that no option should be left off of this magnificent automobile. So, if you're in the market for a Ford F-150 Lariat SuperCrew 4WD that is equipped with copious amounts of options, then we may just have the perfect vehicle to suit your needs. This Ford F-150 comes with new tires for an improved ride, better fuel economy and quieter drive. This car enjoys a high-gloss rust-free paint finish. More information about the 2012 Ford F-150: Ford claims class-leading fuel economy, as well as best-in-class towing and horsepower for both its base V6 engine as well as both of the available V8s. Ford also says that it's the only automaker to offer a 6-speed automatic transmission across its entire model lineup. The F-150 is also the only full-size pickup so far to offer electric power steering, which saves fuel and gives an improved steering feel. Across the lineup, the F-150 carries through with the full redesign that the truck received for 2009; since then, the F-150's very purposeful, upright instrument panel and vastly upgraded interior materials have stood out in this very competitive class. And with the new 36-gallon fuel tank, the F-150's 750-mile driving range puts it in a class by itself. Interesting features of this model are class-leading towing and payload capacities, wide range of models for all budgets, tastes, and needs, available luxury features, fuel efficiency, and Smooth, strong new powertrain lineup STOP IN TODAY or Apply Online 24/7 at Abbottmotors.com ... All Trade-ins Welcome... Same Day Delivery... Call or Text Today and See The Difference... We Look Forward to Serving You! !This vehicle may be subject to potential open recall(s). Vehicle recall information may be found at Safecar.gov. Please verify price, equipment, options and features with your sales rep before your purchase. We Look Forward to Serving You. *Tax, title, plates extra. All Financing On Approved Credit. BBB accredited A+ member.